: The experts, although not unanimous, consider that the Greyhound could have had its origins in the Middle East. Drawings of Greyhound-type dogs have been found on walls in Ancient Egyptian tombs, dating as far back as 4000 BC. Though dogs of the type spread through Europe over the years, it was in Britain that they were developed to a standard. The prototype of the so-called sighthounds, or gazehounds, the Greyhound is well known to many people. 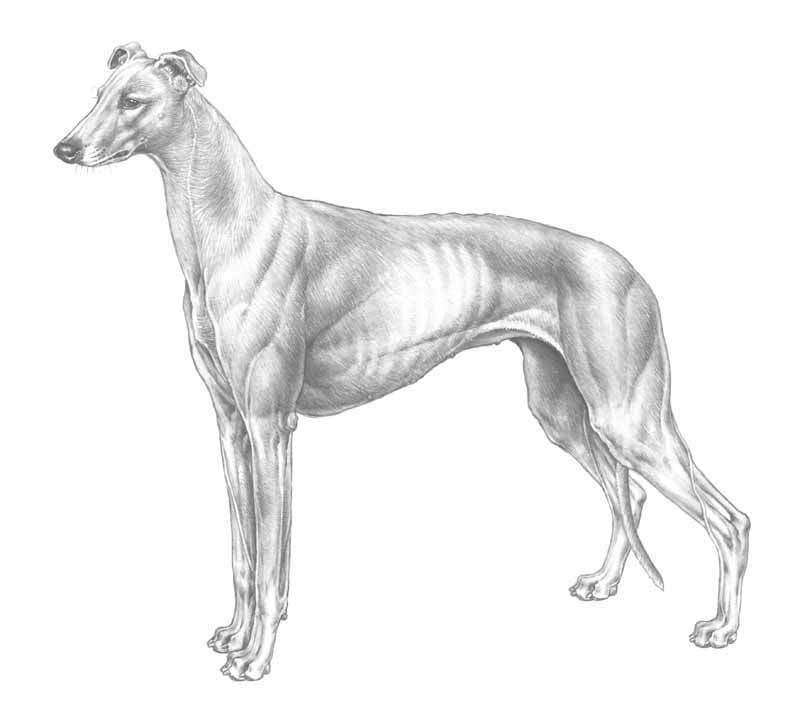 The coursing hound, which hunts the live hare, is what the racing Greyhound were developed from, only the cheetah tops the Greyhound for speed. One racing Greyhound was clocked at over 45 mph. : Possessing remarkable stamina and endurance. Intelligent, gentle, affectionate and even tempered. : Jaws powerful and well chiselled. : Rather long, broad and square. : Deep and capacious, providing adequate heart room. Ribs deep, well sprung and carried well back. : Flanks well cut up. : Elbows, pasterns and toes inclining neither in nor out. : Oblique, well set back, muscular without being loaded, narrow and cleanly defined at top. : Free and well set under shoulders. : Forelegs long and straight, bone of good substance and quality. : Moderate length, slightly sprung. : Body and hindquarters, features of ample proportions and well coupled, enabling adequate ground to be covered when standing. : Thigh and lower thigh: Wide and muscular, showing great propelling power. : Hocks well let down, inclining neither in nor out. Males 71 – 76 cms. Females 68 – 71 cms.